Saturday was a day of firsts. First all grain. First completely original beer recipe. First time the starter wouldn't really start. First boil over. First time with a chiller. First time brewing with someone (the illustrious Mike Jones). First time throwing myself down my basement stairs while holding a ring burner. But first a word about the beer. The beer was, as I said, my first original recipe. It will be henceforth known as Blue Blood Lager. The name is a reference to Vienna (and this was a Vienna lager), home of the Hapsburgs. The Hapsburgs, among other things, were known for having big noses. Also for ruling large parts of Europe, but mostly for big noses. And as I have a bit of a schnoz myself, and admire people with large noses, it seemed apropos. In a further connection, a well known commercial example of the Vienna lager is Negra Modelo, and as the Hapsburgs were also Emperors of Mexico from 1864-1867, the connection is complete. FG- Check back on this. We'll see, as I think I under pitched. Volume- hard to tell given the boil over. I'll be making a "volume stick" this weekend to help with that in the future. This will be an exciting technological development by the LaVoy Boys Brewing Company, so stay tuned! The mash went off fairly well, but not without a hitch. I wasn't paying attention to the strike water, and overshot the temperature by 5 degrees, so we had to wait a few minutes for it to cool down. We were still over on our temperature at dough in, but well within the acceptable range, so I left it alone. I didn't want to get into a vicious cycle of adding hot/cold water to get to the exact temperature I was trying for. The mash tun (a converted 5 gallon cooler with a false bottom) held up nicely temp-wise and without any leaks. 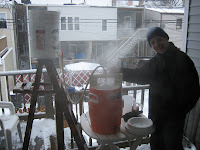 We added a gallon of mash out water, as the mash tun didn't appear that it would take another drop. The fly sparge went as planned on my rigged three tier gravity system (a rickety ladder, plastic picnic table, and burner), and the $2 sparge arm setup (a spihon sprayer, and a couple of 2x4's cut up, screwed together, and drilled in such a way as to sit on top of the cooler with the hose through the middle) worked like a dream. We able to nail the water flow out of the HLT (my bottling bucket) and the mash tun, so the whole lauter/sparge process took no more than twenty minutes. We were a little short on the gravity, but on a first all grain, I think that's probably to be expected. We ended up with 71% efficiency. That left us a little low for a Vienna lager, but I'm not going to quibble about style rules just yet. We then got the mixture on to the burner, got the flame going, and promptly had a boil over of epic proportions. I'm guessing we lost a good 3/4's of a gallon of wort, which resulted in a smaller amount of liquid into the fermenter than I was hoping for. A 10 gallon brew pot is in my future. I was disappointed that we had lost so much brew. Mike was disappointed that he didn't have the camera ready to take a picture of my face as the kettle turned into a wort launching cannon. After we got things back under control, everything ended up pretty normal for the rest of the boil. 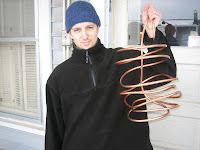 The wort chiller was great, and we were able to go from knock out to 75 degrees in about 20 minutes. Mike was pretty impressed that something so ugly actually worked. I also managed to drain the water out right on to the stairs leading down to the basement. Which turned it into a skating rink. Which I threw myself down during the cleanup process while holding the ring burner. Somehow I didn't mess my back up, which, as it is already messed up pretty good, is no small thing. Where was I? Oh right. Yeast pitching. I had made my starter the night before. I figured that 20 hours on the stir plate would give me a nice big slurry to pitch on to my first lager. Except that the starter never really started. It would foam up a little, and then go back to looking dead. We ended up making a trip to Brew and Grow, and bought a different yeast (also not perfect for the Vienna style, but given the fact that the selection was pretty limited and the Brew and Grow dude was unhelpful, it'll work). I tossed the first starter down the drain, and made a fresh one. It hadn't really gone much by late that night either, but I wasn't willing to risk letting my wort sit there overnight, so I pitched the yeast. After about a 20 hour lag time, some krauesen started showing, and I've got it at a good temperature. All in all, not a bad day. My ingredients and gravity are a little off of the Vienna style, but I'm not going to worry about it too much. Part of that had to do with availability. I learned a ton about my setup, all grain brewing, and being patient with the yeast. Special thanks go out to Mike for helping me brew. My setup is low tech enough that brewing on that by myself would have been damn near impossible. Which means Kerry would have been pressed into service, and I don't think she would have thanked me for that. Kerry deserves thanks as well, as she dealt with a completely destroyed kitchen for most of the day. And also bought me most of the equipment I used for Christmas. If only she liked beer, she could have a proper reward. She'll have to make do with smooches. Congrats on your first all-grain brew. Doesn't it totally rock? Are you mashing outside? I guess I'm curious how you keep consistent temperatures without continually heated mashtuns and unwrapped hot liquor tanks and the like. Perhaps that stuff can be done indoors, and then boil and cool it outside for a couple hours. I see you are here in Chicago. Would you care to meet up sometime? I'm far north. It was exhilirating. I've gone over to all grain, and I don't think I'm going back. 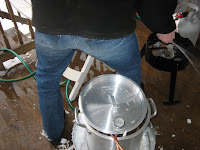 We actually heated the strike water outside, doughed in, and then moved the mash tun into the kitchen. Which was handy, as I did the mash out water in a regular stock pot on the stove, while the sparge water was on the ring burner outside. I really don't understand how we were able to sparge like we did. I've heard of people sparging for an hour. My plan was to not worry about the gravity of the runnings, as it was the first AG. I figured I would just go for the volume I was shooting for, and that would give me an idea of what the efficiency of my setup is, and worry about hitting gravity numbers another time. We ended up stopping the runnings at 1.010, and efficiency was 71%. And the sparge took like 15 minutes or something. I don't know how it went so fast and actually had decent efficiency. Maybe my grain bed was just set up right. Meeting up would be great. I actually live a couple blocks north of where Half Acre is (I'm at Grand and Damen). I even met Gabriel at a tasting once. That said, I have a car and am willing to travel. My email is kmlavoy@gmail.com. Let me know.